There are a many ways to produce electricity. Electrons can flow between certain different materials providing a current, as in a common battery. While reliable and portable, chemical batteries run down quickly. To provide the large amounts of steady power demanded by modern societies, large power plants have been built. Most power plants make electricity with a machine called a generator. Generators have two important parts: the rotor (which rotates) and the stator (which remains stationary). Generators use the principle of electro-magnetic induction, which exploits the relation between magnetism and electricity. In large AC generators, an outer shell with powerful magnets rotates around a stationary "armature" which is wound with heavy wire. As they move, the magnets induce an electric current in the wire. It is important to recognize that electricity is not mined or harvested, it must be manufactured. And since it's not easily stored in quantity, it must be manufactured at time of demand. Electricity is a form of energy, but not an energy source. Different generating plants harness different energy sources to make electric power. The two most common types are "Thermal Plants" and "Kinetic Plants". Fossil-fuels are the remains of plant and animal life that lived long ago. Exposed to high temperatures and pressures for millions of years underground, these remains have been transformed into forms of carbon: coal, oil, and natural gas. Unlike electricity itself, fossil fuels can be stored in large quantities. After 100 years of research and development, fossil-fueled plants are generally reliable, and problems that do occur are usually confined to a local area. Many electric utilities have operated fossil-fuel plants for decades, and these plants (now fully paid for) are very profitable to run. This not only increases profits to the utility, but keeps down the direct cost to users. However, fossil-fuel plants can create serious environmental problems. Burning these fuels produces sulfur-dioxide and nitric-oxide air-pollution requiring expensive scrubbers. Wastewater from the used steam can carry pollutants into water-sheds. Even with very good pollution controls, there is still waste material produced. Carbon-dioxide gas, and ash are the current concerns. Also, fossil-fuels are not renewable. They took millions of years to make, and at some point they will run out. Extracting and transporting them for use has created environmental problems. Strip-mining of coal and oil-spills at sea can produce catastrophic impacts on ecosystems. Oil has become too expensive for most power plants. Coal and natural gas are currently cheap in the US, and are being used more often. These two fuels are being used more efficiently in "cogeneration" plants. Cogeneration is not a new idea, and takes advantage of the way many large electricity users operate. Many factories use steam in their production process. Utilities often make and sell steam for these customers, as well as for running their own generators. Rather than simply condensing and exhausting waste-steam after it has passed thru the turbine, "top-cycle" cogenerators pipe this usable commodity to nearby customers. "Bottom-cycle" cogenerators operate in reverse and use the waste steam from industrial processing to drive turbines. By reusing steam, thermal-efficiency at cogeneration plants can exceed 50%. Recently developed cogeneration plants use new materials and designs to improve reliability, and control both thermal and atmospheric pollution. Since these new technologies are designed into plants from the start, they are less expensive to install. The economy and capability of cogeneration technology allows many plants to return to burning coal without exceeding air-quality standards. "Circulating Fluidized-Bed" boilers, "Selective Catalytic (and Non-catalytic) Reduction", and "Zero-Discharge" water treatment systems are examples of technologies being used to control various environmental problems. Some natural gas plants can produce electricity without steam. They use turbines very much like those on jet-aircraft. Instead of burning jet-fuel and producing thrust, however, these units burn natural gas and power a generator. Gas-turbine generators have been popular for many years because they can be started quickly in response to temporary demand surges for electricity. 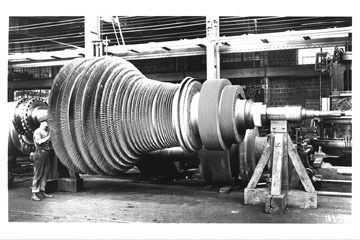 A newer twist is the "Combined-Cycle" plant which uses gas-turbines in this fashion, but then channels the hot exhaust gas to a boiler, which makes steam to turn another rotor. This substantially improves the overall efficiency of the generating plant. In addition to these innovations some thermal plants are being designed to burn "biomass." 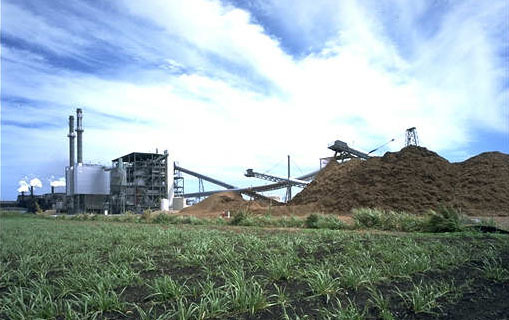 (Shown is a biomass plant in Florida, image copyright US Generating). The term applies to waste wood or some other renewable plant material. For example, Okeelanta Cogeneration Plant in Florida burns bagasse waste from surrounding sugar-cane processing operations during one part of the year, and waste wood during the growing season. Although there are some important technical (and social) differences, nuclear power stations are thermal plants that make electricity in much the same way as fossil-fuel plants. The difference is that they generate steam by using the heat of atomic fission rather than by burning coal, oil, or gas. 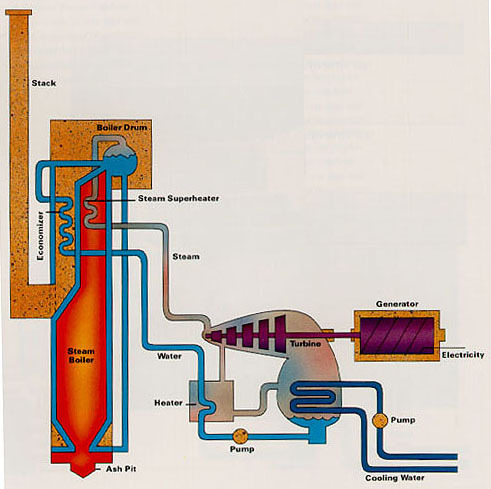 The steam then turns a generator as in other thermal plants. Nuclear plants don't use large amounts of fuel and do not refuel often, unlike a coal plant which must have train-loads of fuel shipped in regularly. The fact that green-house gasses and air-borne particulates are minimal during normal operation makes nuclear power attractive to many who are concerned about air-quality. Waste water is hotter than that from a fossil plant, and large cooling towers are designed to address this problem. However, the drive to field nuclear power in the US faltered in the face of public concerns over safety, environmental, and economic issues. As more safety mechanisms were specified, construction costs and system complexities grew. Also, plants have shown some unexpected quirks, such as boiler tubes wearing out prematurely. Nuclear engineers contend that early problems with nuclear plants are subject to technical fixes, and are working on new "inherently safe" plant designs. Opponents argue that simply using uranium and plutonium as fuel creates too many problems and risks, not worth any benefits the technology might have. So far, one problem which has not been solved is that of disposing of spent fuel cores and contaminated accessories which may remain dangerous for thousands of years. Permanent burial in geologically stable locations is the plan being pursued at this time, though this is still very controversial. High-profile accidents at Three Mile Island in 1979 and Chernobyl in 1986 were, for the nuclear industry, public-relation disasters. Continuing economic problems have made nuclear plants much less attractive investments. Even though it produced 22% of America's electricity in 1996, nuclear power's future in this country is uncertain and hotly debated. Hydro-electric plants and wind-mills also convert energy into electricity. Instead of heat energy, they use kinetic energy, or the energy of motion. Moving wind or water (sometimes referred to as "white coal") spins a turbine, which in turn spins the rotor of a generator. Since no fuel is burned, no air pollution is produced. Wind and water are renewable resources and, while there have been many recent technical innovations, we have a long history of harnessing these energy sources. Problems exist even with these technologies, however. Two basic types of hydro-electric plants are in service. One type, a "run-of-river" plant, takes energy from a fast moving current to spin the turbine. The flow of water in most rivers can vary widely depending on the amount of rain-fall. Hence, there are few suitable sites for run-of-river plants. Most hydro-electric plants use a reservoir to compensate for periods of drought, and to boost water-pressure in the turbines. These man-made lakes cover large areas, often creating picturesque sport and recreational facilities. The massive dams required are also handy for controlling floods. In the past, few questioned the common assumption that the benefits outweighed the costs. These costs stem from the loss of land submerged by the reservoir. Dams have displaced people, and destroyed wild-life habitat and archeological sites. A dam-burst can be disasterous. Some environmental costs can be avoided by thoughtful design; using fish-ladders to permit fish to travel around a dam is one good example. However, other costs remain, and protests against some recent hydro-power projects have become as angry as anti-nuclear protests. A special type of hydro-power is called "Pumped Storage". Some non-hydro plants can take advantage of periods of low demand (and low costs) by pumping water into a reservoir. When demand rises, some of this water is channeled through a hydro-turbine to generate electricity. Since "peak-load" generating units (used to meet temporary demand surges), are generally more expensive to run than "base-load" units (which run most of the time), pumped-storage is one way to boost system efficiency. Wind-farms do not need reservoirs and create no air pollution. Small wind-mills can provide power to individual homes. Air carries much less energy than water, however, so much more of it is needed to spin rotors. One needs either a few very large wind-mills or many small ones to operate a commercial wind-farm. In either case, construction costs can be high. Like run-of-river hydro-plants, there are a limited number of suitable locations where the wind blows predictably. Even in such sites, turbines often have to be designed with special gearing so that the rotor will turn at a constant speed in spite of variable wind speeds. Some find less technical problems with installations that can turn a scenic ridge or pass into an ugly steel forest, or that can take a toll on birds. Other types of power plants do not use traditional equipment to produce electricity. Geo-thermal plants replace boilers with the Earth itself. Photo-voltaics ("PV") and Fuel Cells go further by dispensing with turbo-generators entirely. These alternate energy technologies have been under development for several decades, and advocates believe the technical and political situation will now bring them into the market-place. Pressure, radioactive decay, and underlying molten rock make the deep places in the Earth's crust hot indeed. A vivid example of the heat available underground is seen when geysers erupt, sending steam and hot water high in the air. Natural sources of steam and hot water have attracted the attention of power engineers since early in this century. By tapping this naturally-created thermal energy, geothermal plants provide electricity with low levels of pollution. There are several different varieties of plants, and the product from a geothermal site is used for heating as well as electricity production. Finding suitable sites can be difficult, although as technical innovations occur, more sites are made practical. Tapping geothermal sources can also have the effect of "turning off" natural geysers, and this possibility must be taken into account during the planning stage. Solar-cells or "photo-voltaics" do not use a generator; they are the generator. Usually arranged in panels, these devices take advantage of the ability of light to cause a current to flow in some substances. A series of cells are wired together and the current flows from the panel when sunlight strikes it. They produce no pollution when operating, and most scientists predict that the fuel supply will last at least 4 billion years. Solar panels have been relatively expensive to make, and of course they won't work at night or in foul weather. Some of the processes needed to manufacture them have recently been called into question environmentally. Not all of the sunlight striking a solar cell is converted into electricity, and boosting efficiency has been slow work. Yet, the idea of harnessing all of that free sunlight remains a powerful driver for solar power. Valued for their usefulness on space-craft, fuel cells combine substances chemically to generate electricity. While this might sound very similar to a battery, fuel-cells are powered by a continuous flow of fuel. In the US Space Shuttle, for example, fuel cells combine hydrogen and oxygen to produce water and electricity. Fuel cells have generally been expensive to make and not well suited to large installations. However, they represent a "modular" technology in that capacity can be added in small increments (5 - 20MW) as needed, allowing utilities to reduce both capital expenditures and construction lead times. Research seems to show promise; one test installation in Yonkers, NY, can produce 200kw by using gas created in the operations of a wastewater treatment plant. Also, fuel-cell plants are being used for central power in Japan. The ultimate usefulness of fuel-cells or photo-voltaics may not lie with large central generating plants. In the era before great continent-spanning networks of wires, a small generating station on the premises made economic sense for many business and industrial power users. As motors and equipment were improved and designed to take advantage of the new energy supply, more customers electrified their businesses and homes. In the early 20th Century, small generating companies consolidated and independent plants slowly disappeared. It simply became more economical to purchase power from a centrally-located utility rather than generate it on-site. Large regional power pools grew, as companies interconnected their transmission systems and shared reserve capacity. "Economy of Scale" became the watch-words. This may change in the 21st Century. As the technology of electrical generation improves, and environmental concerns rise, the very concept of large centralized generating stations is coming into question. In most cases, for example, it is not economical to heat homes and businesses from a central location. Individual furnaces provide heat for separate buildings, with fuel provided by an associated transportation and distribution systems. Gasoline or diesel powered generators provide decentralized power to buildings in emergencies, though they are not economical for full-time power. Continued technical improvements in fuel-cells or photo-voltaics may change these economics. This possibility is especially attractive considering the cost of and objections to building large power lines.